Included: Cabinet, Sink, Mirror (27"W x 32"H), Chrome pop-up drain assembly. This fun modern piece will look great in almost any small bath or wash room space. The classic cherry finish gives the unique piece an elegant tone. Above, the large vessel sink provides for plenty of functionality, though you will need plumbing for the wall mounted faucet. 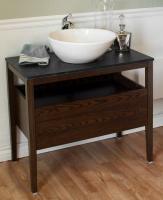 An open shelf and wide drawer offer storage options for towels and personal items. 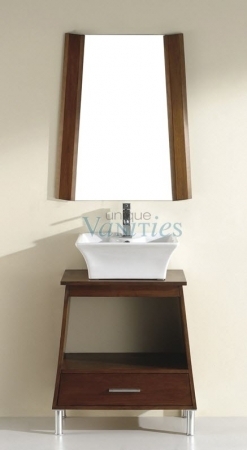 Counter Top: This vanity comes with a wood countertop made of the same material as the vanity cabinet. All hardwoods have been Kiln dried to ensure a stable product that will not expand, contract, or warp.